The worst foreclosure crisis in American history appears to be at least on the mend. Not only have mortgage rates fallen to record lows, encouraging home ownership, but new home construction in November 2012 rose at the highest monthly rate in four years. 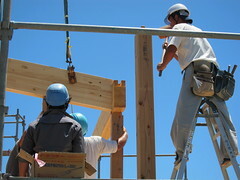 The U.S. Department of Housing and Urban Development and Census Bureau announced on Nov. 20 that October’s estimated number of new building permits nationwide were up 29.8 percent over last year’s October rates (866,0000 vs. 667,000), new housing starts were up 41.9 percent from a year before (894,000 vs. 630,000) and finished housing constructions were up 33.6 percent from the year before (772,000 vs. 578,000). In fact, not since July 2008, has the housing market shown such promise of renewal from one month to the next: a 3.6 percent increase in housing starts over September’s 863,000, a 2.7 percent increase in building permits and a 3.4 percent increase in completions. And owing to a general upswing over the course of the past few years, experts predict it to continue when November’s numbers are released at 8:30 a.m., Dec. 19, 2012. This is not just clinging to hopeful estimates. Consider the deeper evidence: Housing starts were 478,000 in the spring of 2009; in November, they were 87 percent above that rate. At the economic research firm of BMO Capital Markets, experts have illustrated how home sales continue to be at unprecedentedly low levels. The evidence shows the housing bubble started inflating in the late 1980s and continued to balloon until around 2005, often when owners became unemployed, disabled or, quite often, could no longer afford the horribly inflationary loans they’d just agreed to. That precipitous bust has lasted since then, but since 2008, a levelling out has occurred. Not only that, but this plateau coincides with sale prices being at the most affordable level in modern civilization. What’s the problem with that? Demand for homes seems to be on the rise too, with unemployment figures improving. Couple that with more lax credit requirements, BMO predicts, and that just might be the injection needed to keep the recovery in motion and make prices more stable and predictable for owners, who’ve faced a buyer’s market for many years now. Though home inventories are on the decline, the company notes, there are still many millions of foreclosed or otherwise vacant homes on the market. Though stimulus money through HUD has invested billions in turning around America’s hardest-hit neighborhoods, the truth is that many American cities face several more years of recovery. So that means the buyer’s market is, and is likely to continue, for many months to come. Whether it’s Idaho or New Jersey construction, the trends are finally hopeful. For buyers and construction firms, that’s good news. For sellers, at least the prices may stabilize sooner than later. Derek is an active home improvement blogger. When he is not blogging or working, he enjoys doing weekend projects around his house. The article above is for new jersey construction.